As a thoughtful organizer, you want to give your attendees the best event experience you can. That’s why you are always looking for better ways to engage and interact with your attendees. In the last few years, the event tech industry has focused on helping organizers like you. There are many event apps and solutions out there and you are excited to commit to one. However, you are extremely busy. You may not have time to explore effective ways to get the most out of the technology for attendee engagement. Here we summarize a step-by-step guideline you can easily follow from beginning to end. It will take at most 10 minutes for each step with the right tool, so don’t be overwhelmed. The key is starting early. Then it will go smoothly on it’s own. If you announce you’re using an app at least two weeks before the event, you’ll get a much higher ROI (app adoption) than releasing the app two days before an event. Event organizers certainly want to reach over 80% in app download rate rather than 20-30%, which is the average in the event app industry. 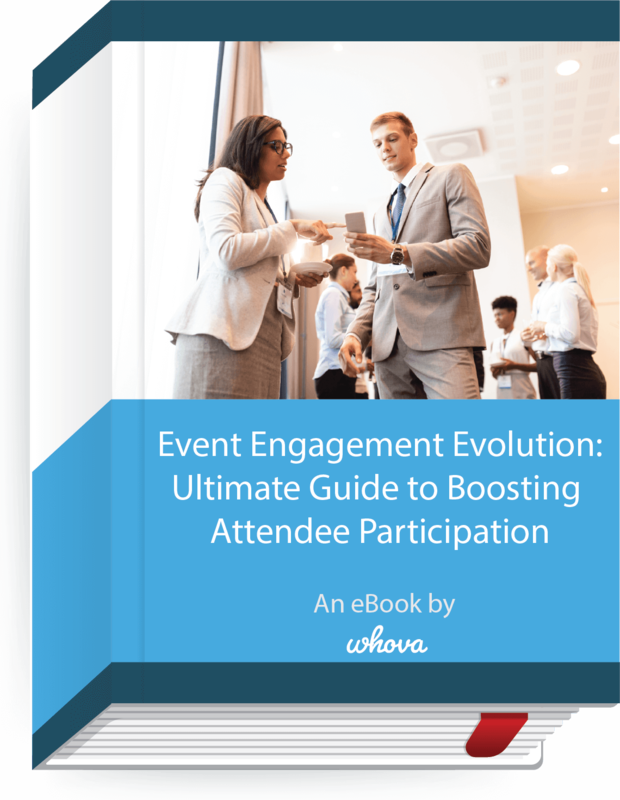 While Whova consistently reaches 72-99% due to a few unique features, if organizers publish it early, we see the event becomes even more engaging to attendees. When you announce you’re using an app, don’t just say, “here is our official event app”, but let users know what they can do with the app. For example, you can say that they can access presentation slides through the app, connect with speakers or find mentors, set a time to meet through one-on-one meeting scheduler, and mingle with fellow attendees through an Event Community Board. These days, notifications via email are no longer enough to spark attendee interest. You want to connect with your guests! Instead of speaking at them, find a way to talk to them by opening up a dialogue. Check to see if your event app supports communication and attendee engagement features, like public chat rooms or a bulletin board. For instance, the Community Board on the Whova app is a central place where organizers can create engaging discussion topics, or answer attendee questions related to event logistics. You can ask attendees what they are excited to get out of the event, or suggest that they post useful tips if they’ve attended the event in previous years. Does your event include group tours or activities, like a city tour, hosted reception, or a golf tournament? Generate buzz about these events and encourage them to participate not just through email campaigns but event app features like Community Board or social media. You will want to see what they are talking about and dive into the conversations to engage them further. Also, check if your app offers a way for attendees to create a group and interact with fellow attendees with similar interests. Many attendees would like to plan dinner gatherings, alumni meetups, activities like morning yoga, or find and hang out with people from their origin countries or cities (Check out real examples here). If your event app has some features for attendees to leverage, let them know about them early, so they can start planning early. You don’t have to do all the talking to engage attendees. It’s also a good idea just to open up a casual discussion topic, like “Recommend your favorite local restaurants or attractions”. Attendees can also interact with fellow attendees with similar interests both professionally and socially. Attendees’ conversations will continue naturally perhaps with user-uploaded photos or discussion posts. Sending a greeting message to attendees is a nice way to welcome and guide your attendees. But you might find that you have low open rates (the average event email open rate is just 21%, according to MailChimp). If your event uses an app, check if you can schedule push-notifications ahead of time, and have it forwarded to attendees emails at the same time. That way, you can reach majority of your attendees without much efforts. See how effective announcements can have organizers’ messages opened by over 75-95% of attendees. Regardless of the subject matter of your event, you can pique attendees’ interest by launching a game for them to participate in. Games are a fun way to get people out of their shell, feeling more comfortable and having fun. Unsure of how to design a game before your event? You can choose something intuitive and simple. 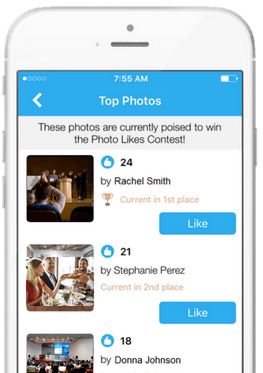 For example, the Whova app facilitates the Photo Contest, which prompts attendees to take photos and share them on the app. They can enjoy browsing others’ photos and click “Like” on their favorites. Organizers can even display the photos on a big screen in real time to create more excitement. It’s simple and easy way to involve everyone (and also have hundreds of memorable event photos). You will see engaging attendees is not hard. Does your event venue have a big screen or a video wall? If so, it’s easy to show off what makes your event spectacular. You can display live tweets through the traditional “social media wall”. Or, if you have an event app, check if the app can sync with the social media wall. For example, Whova’s Social Wall automatically pulls live activities from the app and let you display them on a screen. It’s constantly updating in real time with announcements, photos posted by attendees, last minute event changes, next session reminders, highlights for event sponsors, etc., in addition to social media posts. You don’t have to prepare any contents ahead of time; Just launch a web browser on your screen. That’s it. A live polling is a fun way to engage attendees and allow them to make their voice heard. The possibilities for live polling questions are endless. You can use it to ask thought-provoking questions and draw audiences’ attention during opening remarks, and display the results on the conference’s main stage. Or you can make an informed decision to adjust rooms or the amount of food available by estimating total attendance for the last day’s lunch. It’s also a good idea to use this to run a contest, something like people’s choice award for best speaker or presentation. You don’t have to wait until your event has ended to start gathering feedback. It’s more effective to encourage attendees to submit surveys through an app after lunch or coffee break in the last day of an event than asking them after the event. When attendees drink coffee alone, or wait for the next session in a room, that’s a good time to do a survey. The beauty of using an event app is that you can measure your event’s success by seeing how attendees participated in event activities and networking through an app. Schedule a post-event reporting meeting with an app representative and collect the statistics you need to know. You may also be able to discover interesting data such as attendees’ demographics, interests, and professional backgrounds. You can also use an event app to send a thank you messages to attendees, and include powerful statistics garnered from the app. Let attendees know about your next events. If you had a good app adoption rate and feedback from attendees, it’s also a good idea to continue using the same app to engage your attendees up to the next event. Don’t forget to ask your event app vendors how long the app will be available after your event. Our recommendation is to start early (e.g. 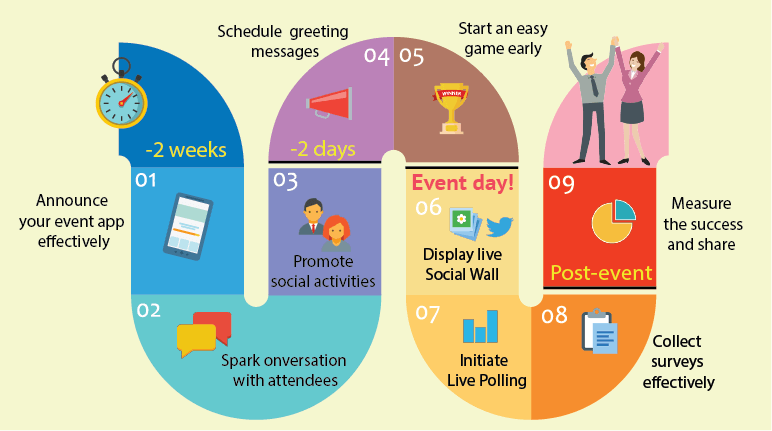 2 weeks before your event) to engage attendees. With a right tool and the step-by-step guidance, it would be easier than what you think. If you’d like to know how Whova can help, please don’t hesitate to contact us.